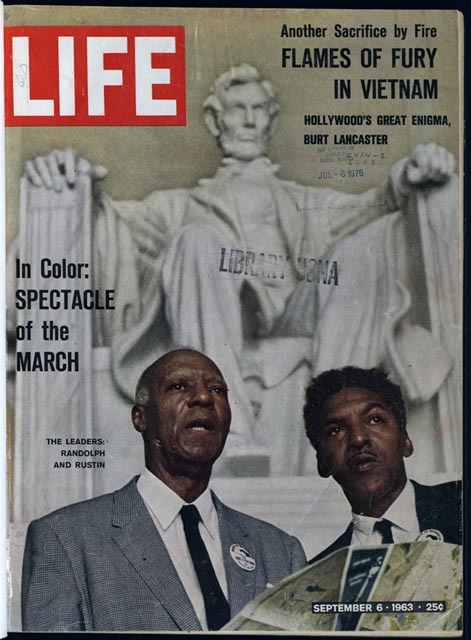 Fifty years after the historic March on Washington, many are surprised to learn that when the event made the lead story of Life magazine, it wasn't the Rev. Martin Luther King Jr. on the cover. Although King's speech ultimately left the most indelible mark on America's memory of the event, it was a photo of the march's two organizers, A. Philip Randolph and Bayard Rustin, that was chosen as the photographic icon of the historic event. Those who are aware of the community of leaders, organizers and minor prophets who galvanized and supported the civil rights movement know that Randolph and Rustin were two of King's most trusted advisers. Rustin, in particular, was instrumental in elevating King's role in the Southern Christian Leadership Conference and is largely credited with introducing him to the strategies of nonviolent resistance. When Rustin first met a 25-year-old King in the early days of the Montgomery Bus Boycott, King kept guns inside of his house and armed guards on the outside. It was Rustin who gently persuaded him to disassociate himself from guns and encouraged him to embrace nonviolent tactics. Historian John D'Emilio writes that the eight weeks leading up to the march "were the busiest in Rustin's life. He had to build an organization out of nothing. He had to assemble a staff and shape them into a team able to perform under intense pressure. He had to craft a coalition that would hang together despite organizational competition, personal animosities and often antagonistic politics. He had to maneuver through the mine field of an opposition that ranged from liberals who were counseling moderation to segregationists out to sabotage the event." "And he had to do all of this," D'Emilio explains, "while staying enough out of the public eye so that the liabilities he carried would not undermine his work." What "liabilities" did Rustin carry? He was a gay man. In 1953, Rustin was arrested on a morals charge after getting caught in a sexual encounter with a man in the backseat of a car. Rustin's sexuality was considered an open secret during the height of the civil rights struggle. He never denied his orientation, and, sadly, his openness would overshadow much of his career in the movement. Although he was an eloquent speaker and profoundly influential in shaping many campaigns for justice and equality, Rustin was typically relegated to behind-the-scenes work. At times, Rustin even faced bigotry within his own circle. The PBS documentary "Out of the Past" recounts a story from 1960, when King and Rustin were planning a demonstration at the Democratic National Convention in Los Angeles. Fearing that the demonstrations would undermine his own power, Adam Clayton Powell Jr., an African-American congressman from Harlem, N.Y., insisted they cancel the protest. If they refused, Powell threatened to claim Rustin and King were having an affair. Of course, there was no affair, but King surrendered to Powell's demands, and Rustin was forced to resign and remove himself from the movement he helped shape. Civil rights leaders later brought Rustin back into the fold to help organize the march in 1963, but fearing his sexuality would discredit the event, they appointed Randolph as the director, and Randolph appointed Rustin deputy organizer. This time, civil rights leaders closed ranks around Rustin, and Thurmond's attacks had little impact. Recalling the incident years later, activist Eleanor Holmes Norton said, "I'm sure there were some homophobes in the movement, but you knew how to behave when Strom Thurmond attacked." Bennett Singer, the producer and director of the 2003 documentary "Brother Outsider: The Life of Bayard Rustin," explained recently in an interview that "allies of the March on Washington were fearful that the march couldn't take place without violence and bloodshed." Always devoted to the principles of nonviolence he learned in the 1940s, Rustin was determined to keep the march nonviolent. And he did. Fifty years later, we know that the march was one of the most crucial events of the last century, if not all of American history. And Rustin did find some vindication in that Life magazine cover. But because of the stigma of homosexuality that endured for much of the 20th century, most Americans will never know Rustin's name or what he managed to accomplish. Thanks to President Barack Obama, however, Rustin will find a new level of visibility later this year: The White House has announced that Rustin will be posthumously awarded the Presidential Medal of Freedom, the nation's highest civilian honor, in gratitude for his extraordinary contributions to the civil rights movement. Today in our country, it is difficult to imagine a gay, lesbian, bisexual or transgender activist being forced into a closet for the good of any cause. But Rustin's story still resonates deeply inside many of our religious institutions. Our churches are home to many LGBT people who make outstanding contributions to the life of the church as lay ministers, teachers, hospital workers, women religious and priests. Many are forced to be silent, however, because some in the church believe their sexual identities discredit or taint their work. Anyone who believes that prejudice in our church is passing away is either unaware of or in denial about the hundreds of exceptional LGBT Catholics who, every year, are fired from jobs, uninvited from speaking in churches, or denied participation in church ministry because of their honesty about their sexual orientations or gender identities. Rustin's life reminds us that, not too long ago, most of our culture believed a person's sexual identity could somehow taint or discredit the knowledge, talent and gifts he or she brings to a community. His story invites us to recognize and challenge the ways in which this toxic and often subconscious belief is still playing out in our churches, communities and families.